The district of Orgemont, which has been urbanized since the 1960s, is now undergoing transformation. 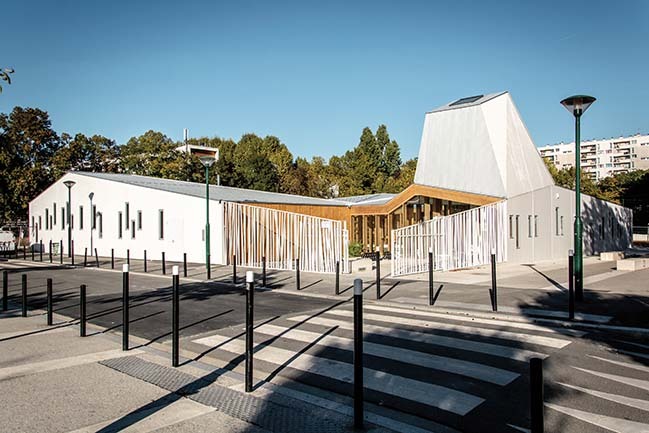 This programme is part of a larger project of Urban Development Policy, conducted in partnership with ANRU (the French National Agency for Urban Renewal), for the redevelopment of the district. Usable floor area: 750 sq.m. 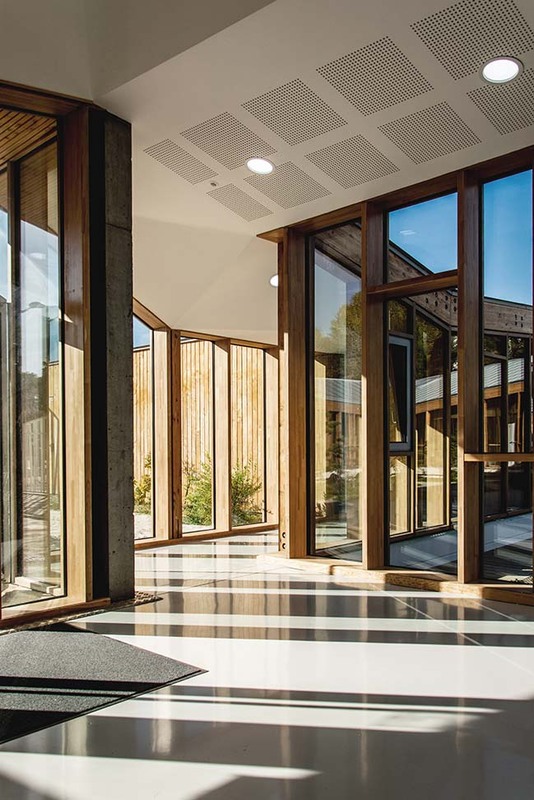 From the architect: The aim of the Town Council is to create a facility that not only fulfils its primary role at neighbourhood level, but also acts as an urban landmark, a symbol of the renewal of this whole area. 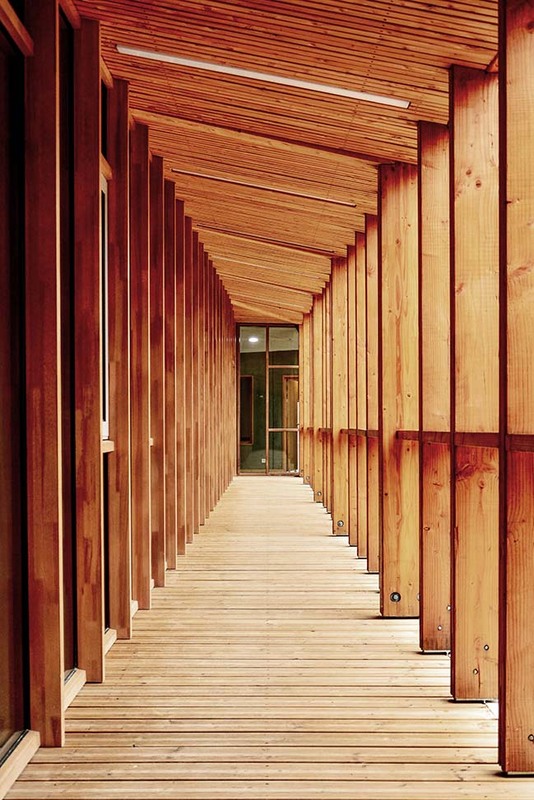 Due to its location — on the edge of an urban park, facing a primary schools complex and at the crossroads of a pedestrian mall and a main street — it was also important that this facility should be easily identifiable from several directions, and that it should have durable, robust facades. 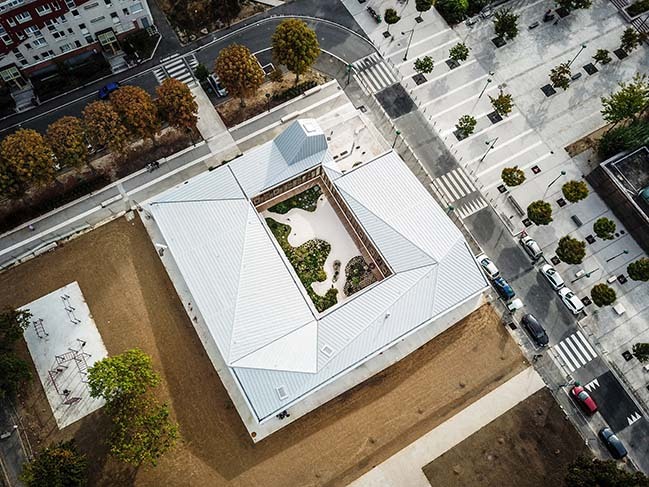 Finally, since the building is also largely seen from above by the neighbouring tower blocks, the roof had to act as a fifth facade with polished architectural treatment. 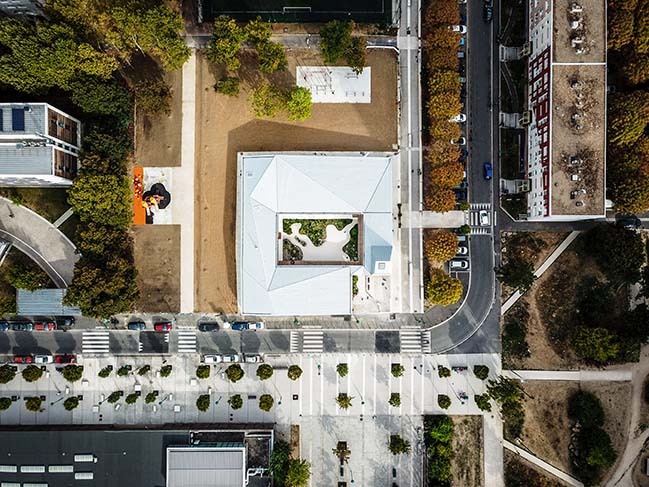 The project benefits from direct proximity to the recent (2014) landscaped pedestrian mall linking a workers’ hostel, a primary schools complex, the Town Hall and the tramway. In the heart of Orgemont, our plot of 3,557 m2 was a green space with a play area. We had to consider the development of a new public garden (with a street workout area and a new play area) and to incorporate the landscaping component of the future park. With its concrete envelope, our architecture, which is comparable to an origami form, opens very little towards the outside. For safety/security reasons, we have devised spaces that open onto secluded gardens in the middle of the dojo. 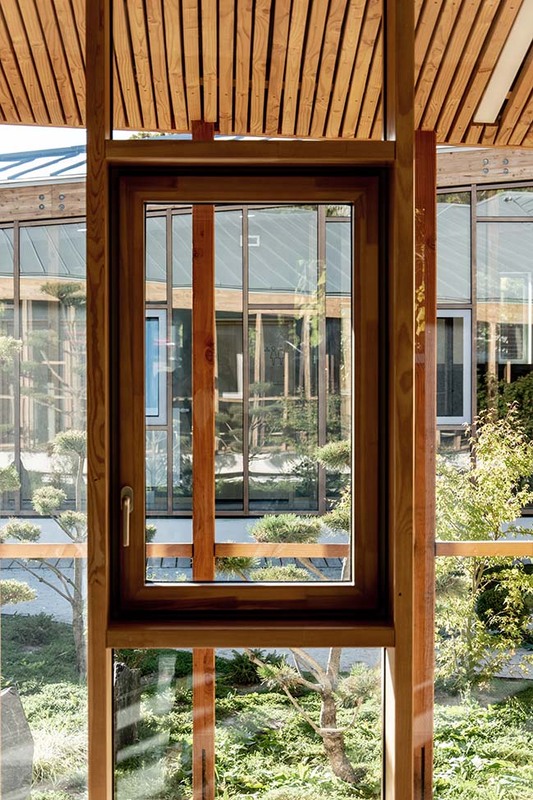 Like Japanese gardens, they are planted with Mugo pine or maple trees. 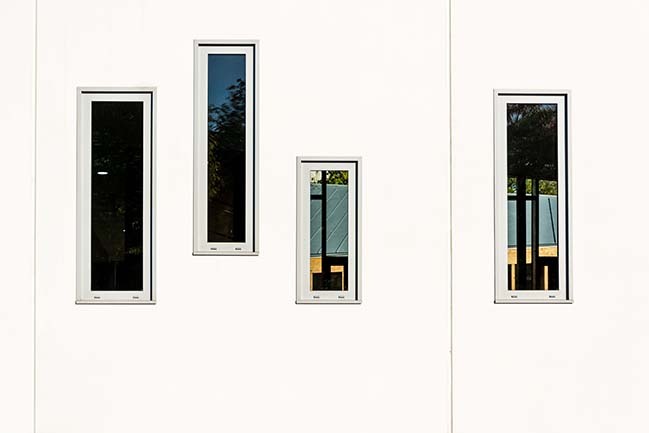 Our architecture offers a balance between the mineral finish of the buildings’ concrete facades and the plants and gardens of the open spaces. 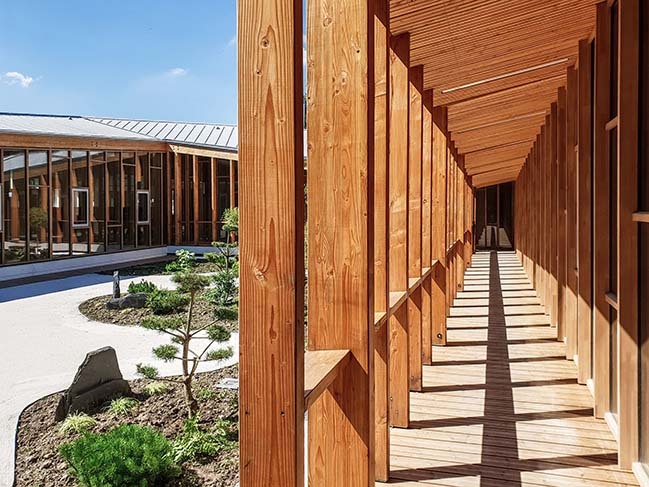 The two Japanese gardens introduce nature and serenity into the spaces. Their appearance and colours vary with the seasons. 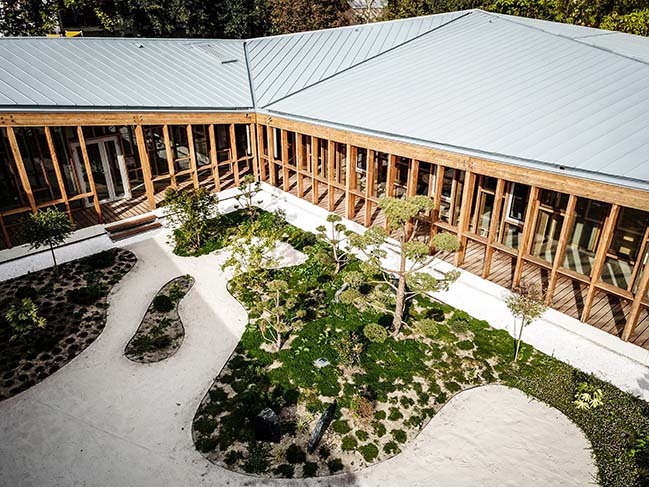 The Zen garden, or Karesensu , welcomes visitors at the south west- (on the corner of Rue de Strasbourg). 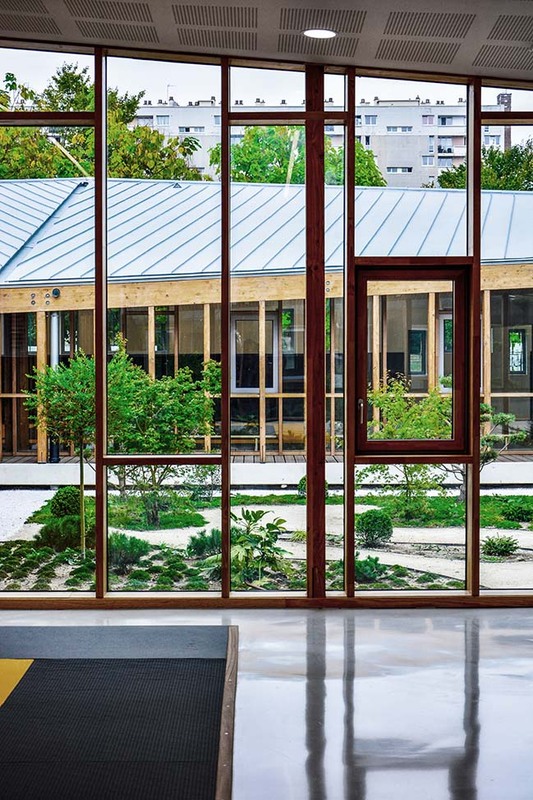 The Garden of Contemplation ,or Kanshoniwa (the planted central patio of the project), separates the two martial arts practice rooms. 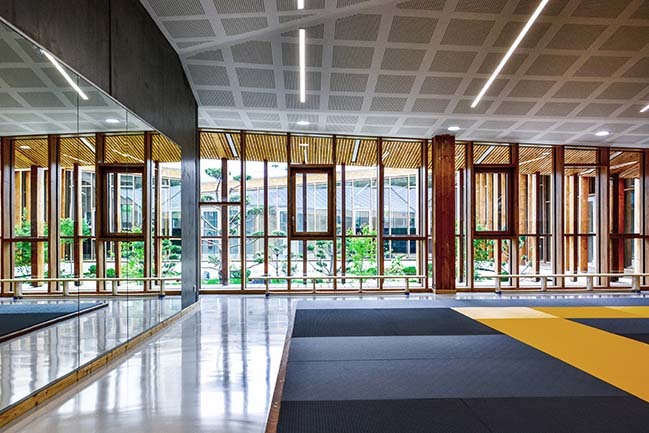 Organized on a square plan, the balanced layout of the four sections of the programme is arranged around the patio: the reception area, the spaces dedicated to sports, the supervision/management area and the building services areas. 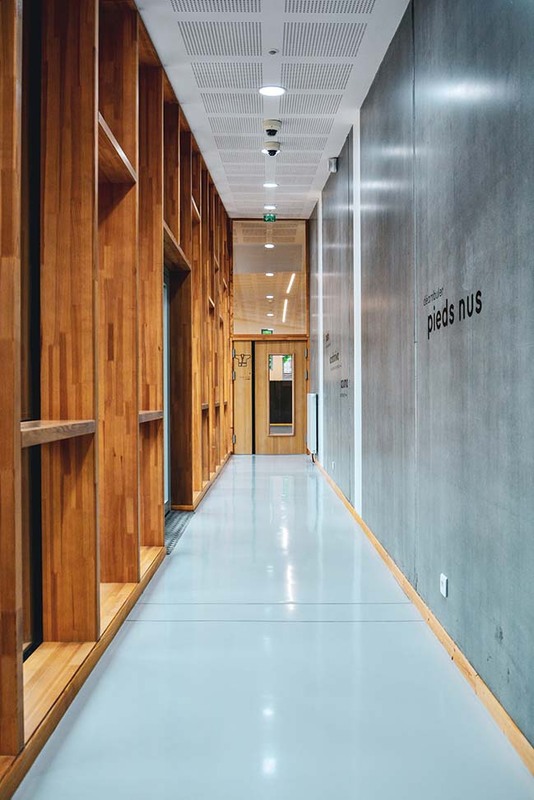 The South wing consists of the reception area, the supervision/management offices, a fitness room and the small areas (cleaning and maintenance room, etc.) necessary for the life of the building. 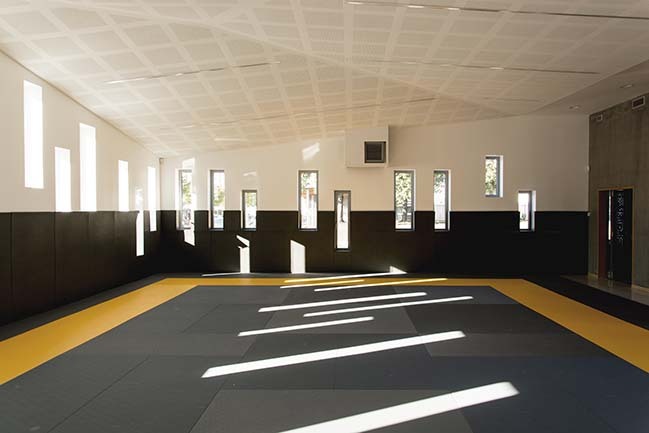 The east and west wings contain the martial arts rooms and their respective locker rooms. The North wing is reserved for building services areas (boiler room and air handling unit) that operate independently and in direct connection with the outside. 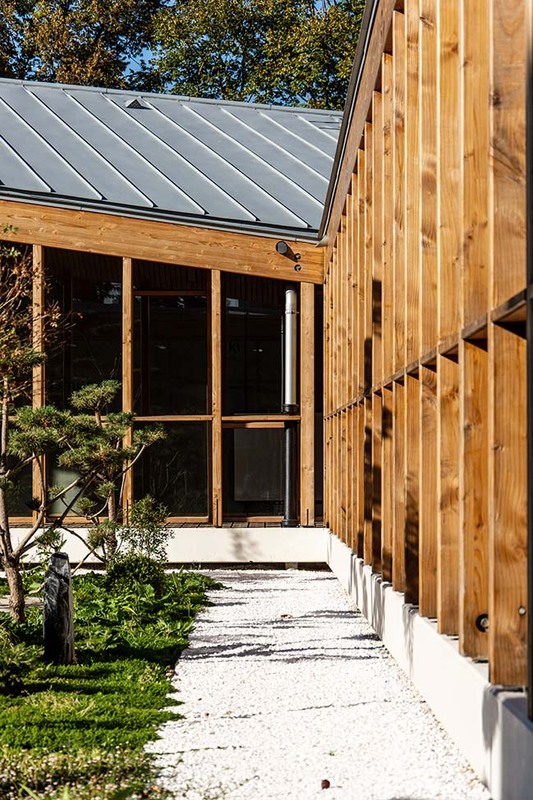 Structurally, the spaces are delimited by grey prefabricated concrete walls(with stained finish) supporting a glued -laminated timber frame (which is exposed on the patio) that echoes traditional Japanese architecture. 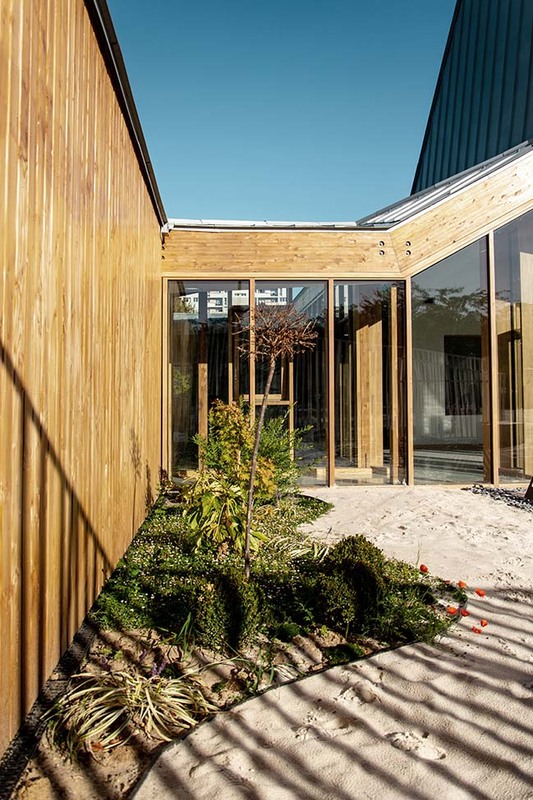 The zinc roof(carefully designed as a fifth facade) offers headroom s of between 3 and 5 metres, depending on the spaces and their uses: low for small spaces and generous in sports rooms. 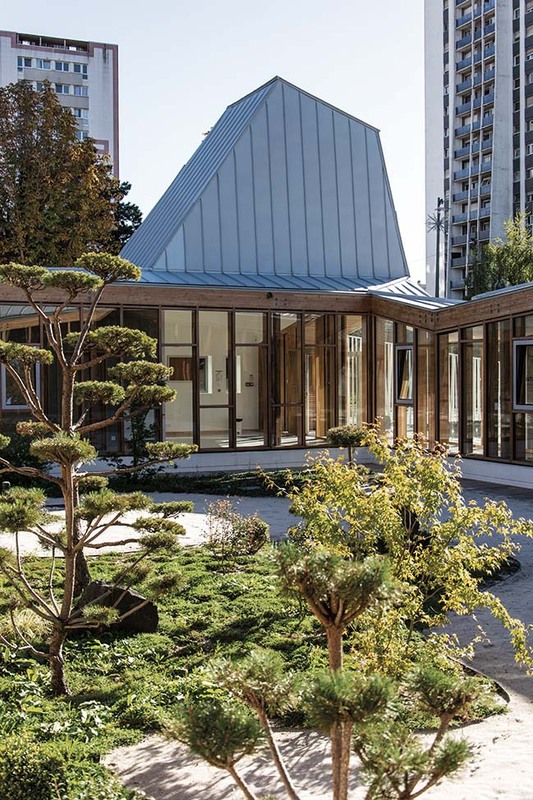 In the district of Orgemont, the facility becomes a landmark, with its entrance identified by the elevation of the envelope which reinterprets the traditional Japanese temple. The walkthrough translates as a progression to the martial arts rooms, places that are traditionally reserved for meditation within a dojo. 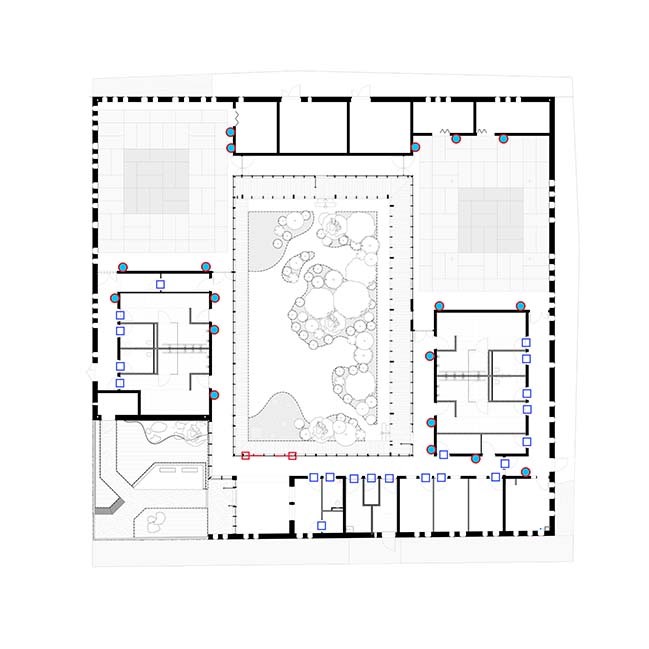 Using the vocabulary of an architectural walkthrough, we punctuated the circulation areas with phrases and keywords. 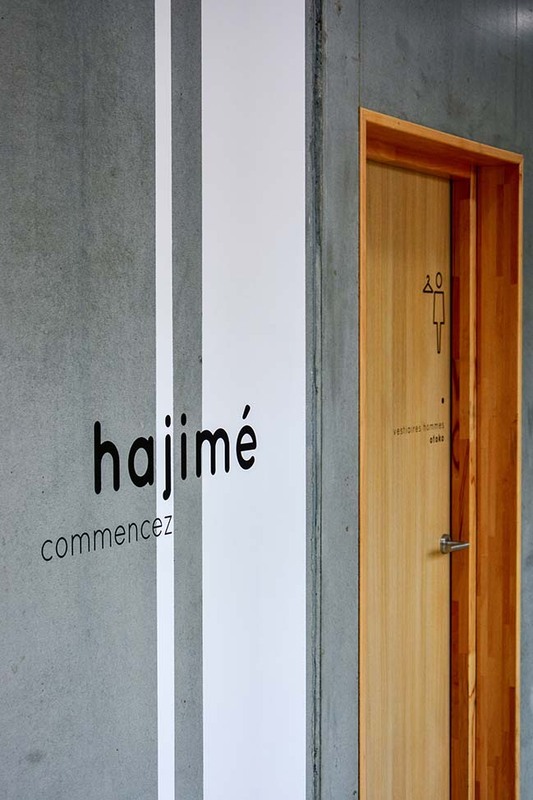 They will make the path towards the various spaces more playful, thanks to pictograms with minimalist design and Japanese words (together with their French translations).